"Nothing in lacrosse is as important as having great instructors. I am proud of our proven track record of providing outstanding coaching. It is my top priority to choose great people who know how to teach the game the right way. To be on my staff, one must have an acute knowledge of the game, a passion to teach it, and know the importance of educating players at lacrosse as well as life"
Kenneth E. Brubaker - a.k.a. "coach B"
Since 2001 Ken has dedicated his life to the development of Michigan lacrosse players through his travel programs, training, Camps, Volunteer youth work and recruiting events. He founded 313 Lacrosse in 2005. Collegiate Assistant Coach - 2009 to present - Western Michigan University (MCLA Division-I) Has coached over 100 college events. Travel Club Coach - 2005 to present. 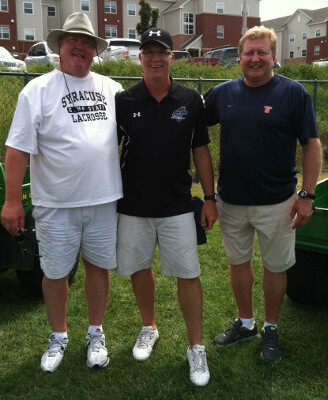 (HS, 14U, 12U, 10U) GP Select, 313 Lax Club, GP Jays, GP Hornets - Over 500 club games coached lifetime. Goalie Instructor - A veteran of over 300 events, with clinics run as far away as Sarasota, FL. Has been on staff at numerous programs such as U of M Goalie Camp, Warrior Elite Camp and All American Lacrosse. Recruiter - Perpetually helping numerous Michigan players advance since 2005. Leads all Michigan clubs with 50 NCAA commits and over 125 total collegiate signings (NCAA/NAIA/MCLA) Founded the Michigan Select 99, a summer showcase dedicated to help Michigan HS Prospects reach their goals. Player - An active goalie at age 60, Ken has played over 350 games between the pipes. He is currently playing on the Hounds an over 55 travel club. Nick was a outstanding Face-Off Midfielder at Adelphi University on Long Island (NY) (NCAA Division-II) and a member of the 1999 CCLA Championship Oakland University team led by Ron Hebert (MCLA Division I) He was nationally recruited while at Troy (MI) Athens HS his senior year (2002) After his collegiate career, he returned to his Alma mater to coach (2007-2012). He led the team to three trips to the state-semi finals. Varsity positions is the past include Notre Dame Prep and Troy HS. He currently is the Varsity Co- Head Coach at Birmingham United (MI) High School. Nick is the Founder of Showcase Recruiting, devoted to educate, prepare, and mentor student-athletes and their families throughout the collegiate recruiting process. Roger began his lacrosse coaching career in 2011. He was an elite high school player at Utica (MI) Eisenhower High School, where he earned all-state honors as a long stick midfielder. He went on to play college lacrosse at Grand Valley State,(MI) (MCLA Division II) where he was a three-year starter earning all-academic honors. He most recently spent the previous three years as a varsity assistant coach at Detroit Country Day School (Beverly Hills, MI). We was teh defensive coordinator at Warren (MI) De Salle Collegiate HS from 2013-2015. As a club coach, Roger was previously the Eastside director for the Powerplay Lacrosse Club (MI) and also was on staff at True Lacrosse (MI). Brad comes to us from Western Michigan University (MCLA Division I) He headed up the program from 2014-18. During that span the Broncos made conference playoffs for only their second time in program history. In 2018 Brad was awarded CCLA Coach of the Year. Brad played Attack four years with Western Michigan University (MCLA Division I) where he was the Broncos captain for two seasons and All-Conference (CCLA) his senior season. He has coached at the High School level as offensive coordinator for Portage Central and most recently with Vicksburg High School. Brad is currently the head coach at Port Huron United in Port Huron Michigan. Brandon is currently playing professional lacrosse with the Ohio Machine (MLL). Played at University of Detroit Mercy (NCAA Division-I) & holds the team record for face-offs (725) during his 4-year collegiate career. He was a 3-year All State HS player and twice MVP at Grosse Pointe North HS where he won 90% of his face offs senior year, a school record. "D-Port" was GP Select U19 MVP in 2009. Mike is the current head coach at University Liggett School in Grosse Pointe Woods, MI. A graduate of Kenyon College, Mike is amongst the all-time scoring leaders with 176 points. He is veteran High School Coach with 18 years experience including powerhouse programs such as Sewickley Academy (PA), Berkley HS (CA) and Lausanne Collegiate (TN) where he helped lead the Lynx to two state championships. Coach C comes to us from San Diego State University, (MCLA) (Division 1) where he has instrumental in advancing the team to the Nationals after a 16-5 season. Played Midfield at Albion College (MI) (NCAA Division-III) Steven was a highly recruited player, and was frequent starter for the Brits. He was an elite level player at LAnse Cruese HS, Harrison Twp (MI) He is currently an Assistant Coach at Aquinas (MI) College (NAIA) and former AC at Grand Valley State University (MI) (MCLA Division II) Coach Treppa is a frequent contributor to 313 Lacrosse, coaching with GP Select, GP Hornets, and the 313 Academy. He is the current director of 586 Lacrosse, a valued partner with 313. Peter was recruited by Adrian (MI) College (NCAA Division-III). He transferred to Grand Valley State University (MI) in 2014 were he helped lead the team to a National Championship (MCLA - Division II). He played close Defense and LSM for L'Anse Cruese HS, Harrison Twp (MI). A tenacious competitor, he is known one of GP Select's all-time best defenders and was voted Defensive MVP in 2011. Peter also coached at GVSU (MI) and is currently on staff as the Defensive coordinator for Aquinas (MI) College (NAIA). At 313, he's coached with GP Select, the GP Hornets and is on staff at the 313 Lacrosse Academy. Tim comes to us from the historic Grosse Pointe (MI) North HS programs of the late nineties. During that era, Tim a midfielder, was part of a Norsemen team which were amongst the best in the Midwest. He was part of the last HS team from the Grosse Pointe area to appear in the state finals. His father was a long-time coach who's hard nosed style was legendary. Tim went nearly undefeated as a GP North JV coach amassing a .850 record over a 60 game career. He attended Wayne State University (Detroit, MI). Michael is a currently GA at Wheeling (WV) Jesuit University (NCAA Division-II) He was a four-year player at WJU. Mike was a 3-year letter winner at LAnse Cruese HS (MI) and was named team Captain his senior year. "Jabba" played three years of club lacrosse for 313 and GP Select and was the 2013 GP Black team MVP. A HS standout, Michael and the LCHS All-time leader in goals. He recorded 242 points while averaging 4.65 points per game during high school career and was a two-time All-State Honorable mention. He began his coaching career with the LC Chargers 14U program in 2011. Mike joined the 313 staff in 2014 and is currently a 586 Lacrosse Club coach. John was the Varsity offensive coordinator in 2018 at Portage Central High School (MI). He played Midfield at Western Michigan University (MCLA D1), played HS lacrosse at LAnse Creuse High School (MI) North. A long time 313 loyalist, Johnathon played club lacrosse with GP Select and 313 Lacrosse for three consecutive years. Jack was a defensive specialist at Alma College (NCAA Division III) and Clearly University (NAIA) As a former middle school coach for University Liggett School, he tallied several successful seasons during his tenure. Jack was also the Director of Lacrosse Operations for Concordia University (NAIA) from 2017-2018. Jack played his HS ball at Grosse Pointe North. He is GP Select and 313 Lax Club Alumni.